Casey House, a specialty hospital and global leader in HIV/AIDS care. 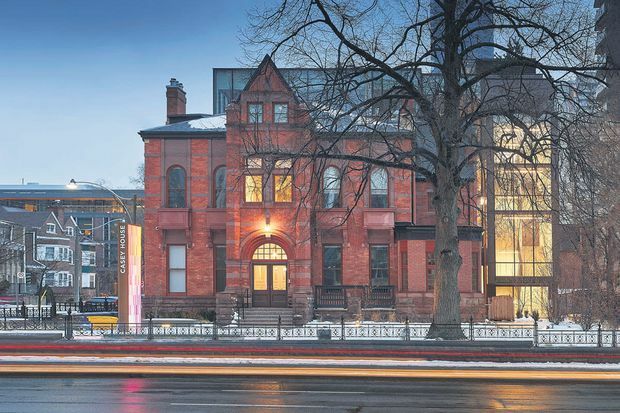 When Casey House, Canada’s only standalone hospital for people with HIV/AIDS, opened its doors in 1988, its first patient was brought in by medics in hazmat suits, such was the fear and stigma surrounding the disease at the time. While a lot has changed since then in treatment of people with HIV/AIDS, it’s still a serious health threat, and the stigma remains a huge issue for people living with HIV, says Casey House CEO Joanne Simons. She points out that two to three Ontarians are diagnosed with HIV every day, and not everyone has access to the care they deserve. Last year, Casey House opened a new home, marking the final step in its evolution from a hospice founded in 1988 to a specialty hospital and global leader in HIV/AIDS care. That journey would not have been possible without a donation of $2.5-million in 2000 by the Association of Fundraising Professionals’ Outstanding Philanthropist of the Year for 2018, Toronto businessman Mark S. Bonham. Mr. Bonham says he wanted his donation to go directly to the care of individuals with AIDS and HIV. Casey House’s reputation and skills are recognized worldwide, so it made sense to support the experts in this area. “Casey House’s reputation and skills are recognized worldwide, so it made sense to support the experts in this area,” he says. The transformation that Mr. Bonham’s donation enabled at Casey House included the creation of an outpatient day health program that bridges the continuum between community-based care and inpatient services and addresses gaps in HIV care. As a sub-acute hospital, Casey House also has an inpatient program for those who need 24-hour care and provides community care and outreach, including in-home nursing, social work and case management for people unable to travel to the hospital. The size of Casey House and the scope of its services may have changed since 1988, but its compassionate approach to care has not. The goal of the AFP Foundation for Philanthropy – Canada, according to chair Roger Ali, is simple but comprehensive: to strengthen giving and volunteering across our country. The Foundation approaches that critical goal in a variety of ways, including supporting research like What Canadian Donors Want, the premier study on how Canadians give to charity, and the Fellowship in Inclusion and Philanthropy, funded from a grant through Canadian Heritage, which builds the capacity of emerging fundraising leaders that reflect the diversity of our communities. The Foundation works to support all those who want to get involved in philanthropy. Fundraisers, donors and volunteers can learn more at afpcanadafoundation.org.